This post is part of our special coverage Tunisia Revolution 2011 . 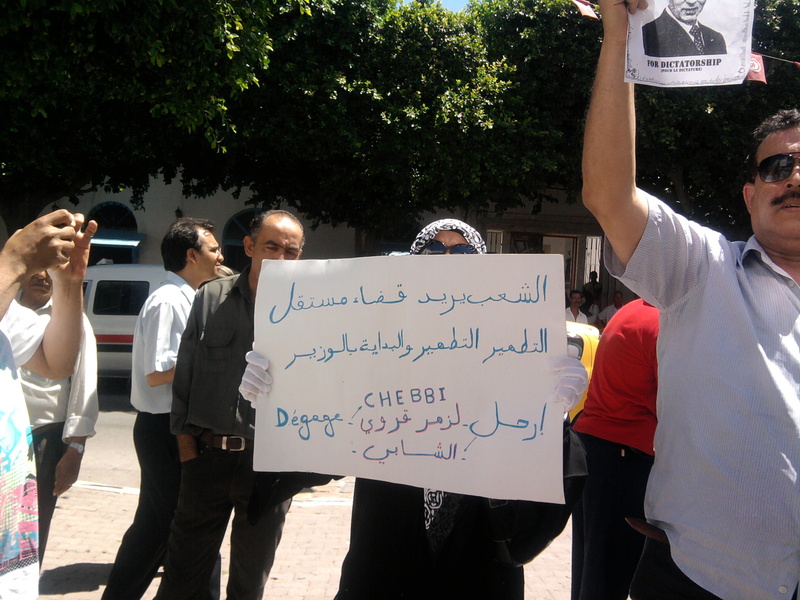 “People want independent judiciary” is a slogan that has been recently raised in the streets of Tunisia. The protests came as a reaction to the release of two ministers from the former regime accused of corruption. Last week, a court freed former Transportation Minister Aberrahim Zouari and Justice Minister Bechir Tekkari, who were both found not guilty. Zouari was later on summoned for investigation on other corruption charges. The two ministers are believed to have used their position to serve their own interests and make more profit. More than six months after the revolution, the judicial system has yet to improve its image after acting for years as a puppet in the hands of the autocratic regime of ousted Tunisian President Zine El Abidine Ben Ali. Saida Agerbi, a close ally to the ousted president, accused of corruption and of spying for the former regime, was also allowed to leave Tunisia to Paris, and was not stopped by authorities at the Tunis Carthage Airport. An independent judiciary capable of bringing to justice former corrupt officials, and those responsible for the murder of peaceful protesters is a key popular demand in Tunisia. prosecutors have been slow to prosecute other figures in Ben Ali’s entourage. The release on Thursday of the former transportation minister, Aberrahim Zouari, who had been charge with corruption during his long government career, has caused outrage among online activists. Activists see this as yet another insult to the revolution, proving that the state is unable to reform the institutions so closely associated with the corruption of the former regime. Last week, Tunisians experienced hard times. Bad news succeeded one another. Mrs Saida Agrbi, a woman known for being corrupted and known for her loyalty to Ben Ali and his wife[…]Two ministers known for their crimes against Tunisian people under the Ben Ali's regime were released[…]Tunisians reacted to all these sad developments. A small sit in was organized outside the First Instance court of Tunis. Some lawyers have successively given speeches about the current situation of the country and the necessity of carrying the revolution on. Today a demonstration was organized in the capital and people walked from outside the General Union of Tunisian Workers building to the Main Avenue of Tunis and stood outside the Theatre shouting freedom slogans. The trial in absentia of Ben Ali, and his wife, have not satisfied the public, as many consider the trial as a “play” as long as the Tunisian judicial authorities seem unable to pursue Saudi Arabia to extradite the former presidential couple who are living in Jeddah. Banner reads "People Want Independent Judiciary. Cleansing, Cleansing, Cleansing, Starting with Justice Minister Chebbi. Get Out!". Photo by Afef Abrougui on Flickr. The Ministry of Justice tried several times to reassure the public that the judicial system is independent in Tunisia and is doing its best to hold accountable those who stole public money during the rule of Ben Ali, and those responsible for the murder of protesters during the revolution. This does not seem to convince neither bloggers nor protesters. Always, according to a communiqué from the Justice Ministry, the judiciary, as well as the investigating judges, have become totally independent since January, 14. In this case, there are two assumptions. Either those in charge of the files are irresponsible, and incompetent, and they have to be fired, or our judiciary is totally corrupt, and the falling of the former regime may lead to the fall of several corrupt judges, magistrates, and lawyers. Personally, I opt for the second assumption. Others chose to make jokes about the Tunisian judiciary, by comparing it to the Egyptian one. 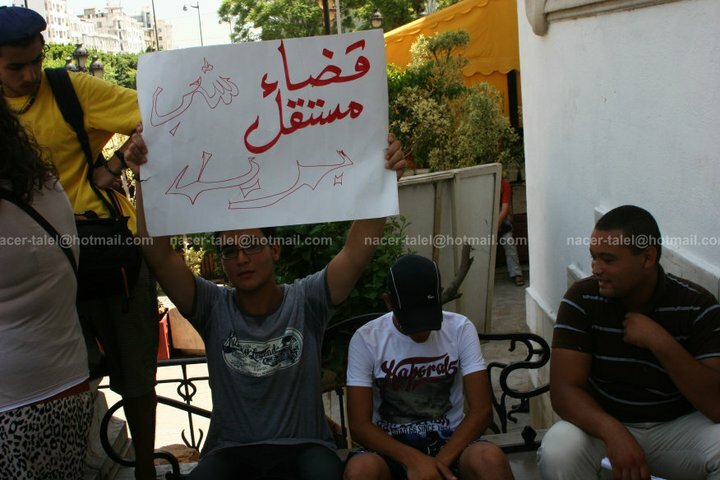 Meanwhile, Tunisian netizens have been using social media to call for other protests. A protest called “People Want the Revolution Again”, was launched on Facebook, and is due to take place next Saturday night [August, 13].